Wash urad dal and rice separately. Soak in water for 3 hours in two bowls. Blend them separately to smooth paste using some water. Mix them and add the salt. Keep it for the whole night. Mix the batter well next morning till it is sufficiently thick. Mix the green chillies, onion, coriander leaves and ginger in a bowl. Heat a flat griddle and rub some oil on it. Pour some batter on it with a ladle and spread it to a thick circle. Cook it on the other side. 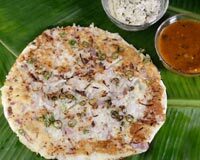 Sprinkle some onion mixture on the top side and overturn the Uttapam. Cook in the same way on the other side. When it is roasted enough, put it down on a plate.